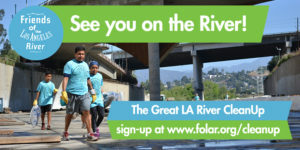 Join APA Los Angeles and Emerging Planning Professionals on Earth Day, Saturday, April 22 in supporting the Friends of the Los Angeles River (FoLAR) in their annual Great LA River Cleanup. This is a great way to bring even more awareness and act as stewards to a vital piece of our urban environment. Please note the updated location–the Arroyo Seco Confluence which is accessible from the Lincoln/Cypress Gold Line Station. Please RSVP to Thea Trindle (theadora.trindle@nullgmail.com) or Steven Keith (S.Keith@nullfehrandpeers.com) if you are interested in participating. Please let us know by April 14th if you will be able to join us so that we can register the correct amount of volunteers. If you would like to volunteer with us, please complete the mandatory waiver and bring a copy with you on the day of the event.